There is something in the air of Verona that is hard to miss. Perhaps this is why Shakespeare set not one but three of his plays here – Romeo & Juliet, the Two Gentlemen of Verona and The Taming of the Shrew! As I enter this quaint city, I am enamoured by the sheer beauty that surrounds me. Tree lined avenues, beautiful walkways, a stunning lake with sea gulls fluttering all over and buildings that are quaint and fairy-tale like. As I am walking towards the town centre, a board catches my attention – ‘Knitting for Juliet’ with a heart shape in between and I know this will be a trip ode to Shakespeare. At the centre of the town, you will see an ancient amphitheatre, shops, churches, cafes and a town square around which the town functions. 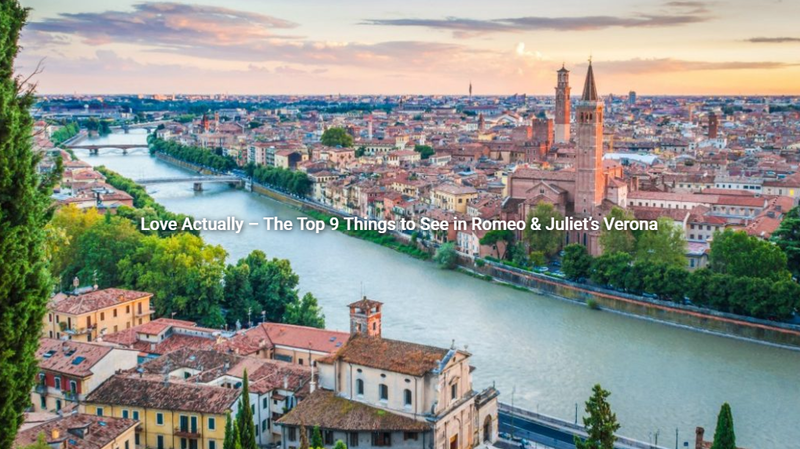 Here is my list of top 9 things to see and do in Verona. Verona’s Cathedral (Duomo) was consecrated in 1187 and has frescoes dating back to the 14th century and sculptures by Nicholaus that date back to the 12th century. The church has gone through renovations and has many Gothic windows from the renovations from the 14th century and the Baroque designs atop the facade dates back to the 18th century. Do take time to hear the church bells that ring in the Vernonese tradition even to date. The Church itself is dedicated to Santa Maria Assunta and this place is said to have been present even during the times of the Roman Empire. This is the market square of Verona and is surrounded by heritage buildings all around that mark important events that go back in history as far as the city is concerned. The fountain of Piazza delle Erbe in the centre is a beautiful sight in pristine white and goes back to the 13th century. The Houses of the Mazzanti date back to the 14th century while the Maffei Palace dates back to the 17th century and has a terrace that had a vegetable and citrus fruit garden in it. The Gardello Tower here has been restored and has the clock bell to mark time for the locals. The Casa dei Mercanti or the Merchant’s House became the Chamber of Commerce after going through several renovations in the course of the hundreds of years it has been in existence. The square today however is a hub and is the hub of political and economic life. Easily the most visited place in town, this is located in a house of the Medieval origin and has been the official property of the Dal Cappello family. This is the house of Juliet from Shalespeare’s Romeo and Juliet. While the story is fictional, it is true that the Capuletti and Montecchi families in Verona were rivals. A life sized bronze statue of Juliet in the garden is easily the most photographed and it is believed that touching her breast helps you find love! The courtyard is open to the public and is usually quite crowded and the house is now home to a museum housing period antiques and paintings relating to the play and is ticketed. For people who want to get married here the ceremony can be conducted on Monday when the place is closed to the public. 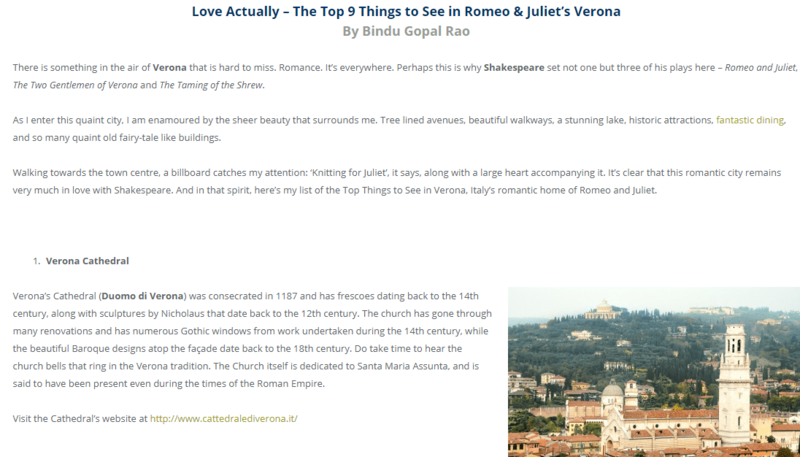 The balcony where Romeo promised Juliet his eternal love is where people stand and pose today. An amphitheatre built in the first half of the 1st century A.D. (yes you read that right!) and is the third largest in Italy. The elliptical structure aids in increasing the acoustic quality of the performances and can seat several thousand guests at any time. Of course the number is restricted to 15000 now-a-days due to security reasons. The pink-brown exterior facade of the building is imposing and gives you a sense of the larger than life structure even before you enter the place. What is most amazing is the way this structure is preserved even to date. This is the venue of the annual Arena Opera Festival where some great opera performances happen and this is a great time to be in Verona too. This is a theatre built in the late 1st century BC and today only some parts of the edifice remain like the cavea, steps, and arcades of the loggias and some of the remains of the stage. The setting of this theatre is lovely thanks to the stunning hill side. The archaeological museum of the Roman Theatre has important artefacts reflecting Verona’s Roman past including inscriptions dedicated to God, ancient mosaics and marble decorations. In the summer this becomes the venue for music shows in an open setting. Retail therapy is always fun and at Verona’s Centro Storico which is the old town, this goes up several notches higher. The main shopping street here Via Mazzini not just has some of the best brands of the world but also houses several high-street stores including Calzedonia and Stradivarius that retail high end designer clothing. The best part is that there are several cafes that dot this place so if you are tired, simply hop into one of the cafes and sip on coffee. If not anything just the ambience and the caffeine will inspire you to shop some more! If there was one building that is a great ode to Roman architecture in Verona it is the beautiful Basilica di San Zeno Maggiore. The cream and brown facade of this place was built in honour of the patron saint of the city – St. Zeno and has some stunning frescos dating back to the 12th to 15th centuries. The Church has three levels and an attached abbey that used to be the residence of the Holy Roman Emperors of the past. When you are here, check out the rose window in the shape of a Wheel of Fortune a fine example of Gothic architecture. The bronze door here is decorated with 48 square panels and the bell tower is a separate building here. This is an old castle in Verona and is a red brick wall structure is said to be an important military construction of the Scaliger dynasty that ruled Verona in the Middle Ages. A good example of Gothic architecture the castle has seven towers and now houses the Castelvecchio Museum and the local officer’s club. The ditch all around the castle would be surrounded by waters from the River Adige in the past. This is Romeo’s House and is an ancient medieval structure and has crenellated walls. The house is not open to public. However there is a restaurant that has some of the rooms of this house and was once occupied by the Montecchi family. Like the Juliet’s House, the graffiti here is all over the name plate. The inscription here reads “Oh Romeo, Romeo, wherefore art thou Romeo?” “Tut! I have lost myself; I am not here.” This is a smaller place and can be accessed by a short walk from Juliet’s museum in a narrow lane.